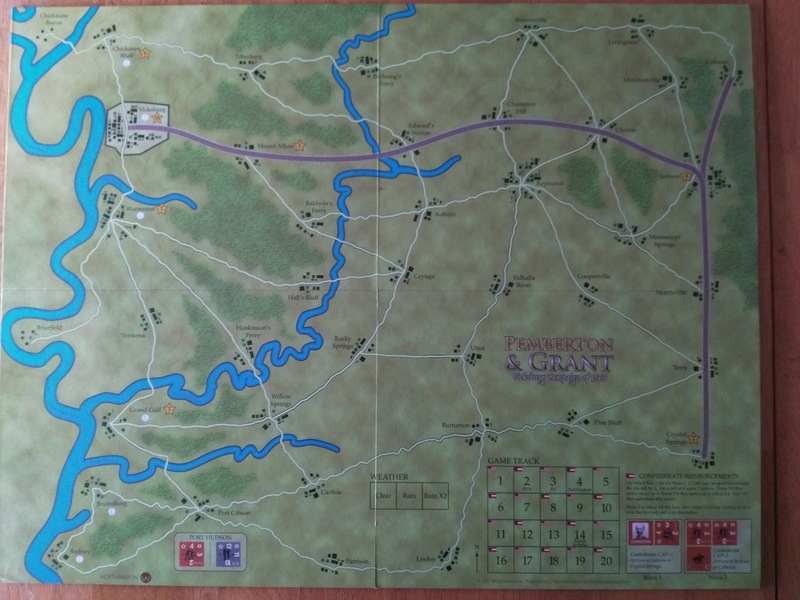 This game is about Grant's campaign to take Vicksburg, and to capture the last Confederate stronghold on the Mississippi River. A lot of military historians have written that Grant's generalship during the campaign was second to none. 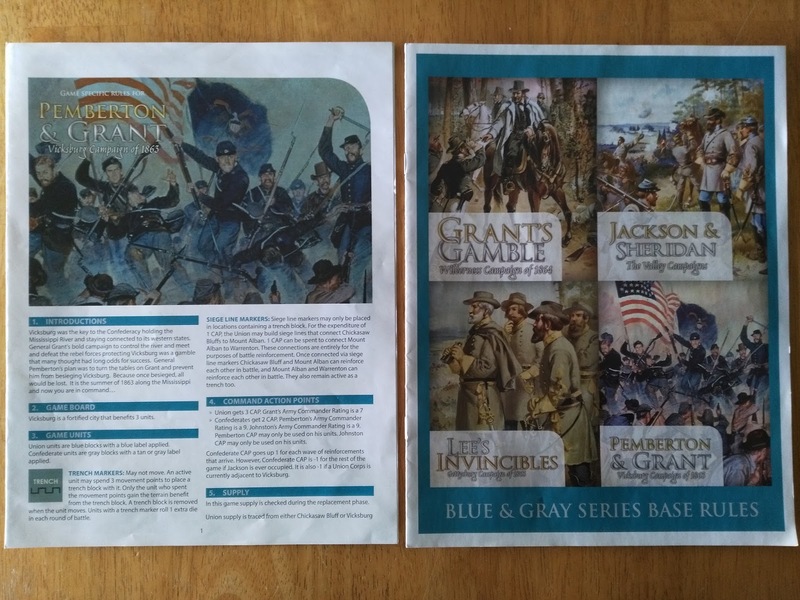 Many times Grant is just decried as a butcher who was lucky to have a 2 to 1 advantage over the Army of Northern Virginia in 1864.This campaign and some earlier ones are proof of his military skill. Back to the decisions. As I said, Pemberton & Grant is full of them. The first decision is made by the Confederates on turn four. Port Hudson is portrayed by an off board inset. It has the Confederate Gardner unit being besieged by the Union XIX Corps. If the Confederate player evacuates Port Hudson he receives the Gardner unit as a reinforcement. Then the Union player starts on turn seven to make a single die roll and on a roll of six the Union XIX Corps shows up as a Union reinforcement. 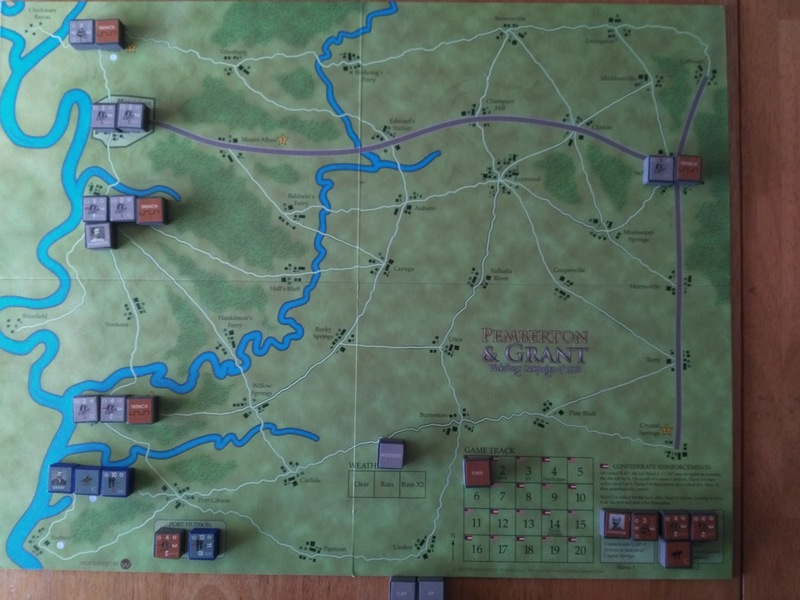 If the Confederate player does not evacuate Port Hudson, then starting on turn ten the Union player rolls one die and if it is a six Port Hudson falls. If a roll of six occurs, then on the next turn the Union XIX Corps comes on board as a Union reinforcement. A single die roll is used to see how many hits have occurred to the XIX Corps before placing it on the map. Another decision is if the Union player controls Vicksburg or Chicksaw Bluff he can try and add to his replacement points, but again at a possible cost. The Union player may also call in more reinforcements (XVI, IX, Corps or the Herron unit) at the price of substantial victory points. The list goes on and on. The Union player, naturally as the attacker, has the most options to start with. He can go straight after Vicksburg or head to the north of the map to Chicksaw Bluff to ease his supply situation and to hamper the Confederates. He can also head straight to Jackson in the northeast corner to impact the Confederates' possible reinforcements later in the game. 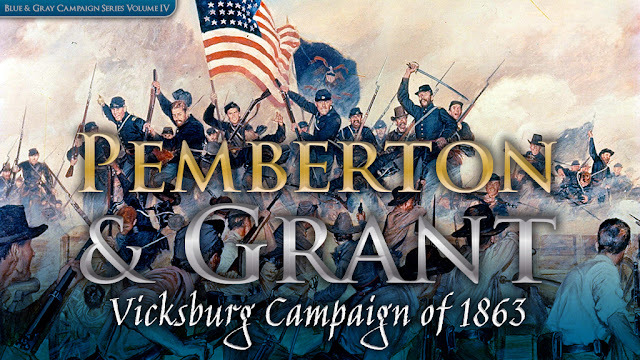 The Union player is blessed with Grant and his higher CAP (Command Action Points) compared to the other two Confederate generals, Pemberton and Johnston. The Confederate player is hampered by your lack of CAP points and the small amount of troops you have to defend so many areas so far apart. The Confederate player on turns four through nine has to make a die roll for reinforcements. So playing as the Confederate, do you sit tight in your trenches and hope for lucky rolls, or actively try and battle with Grant? Because Grant and only one Union corps are on the board for the first turn and the Confederates start on turn one as the active player, some people on BGG have stated a good strategy is to attack Grant on the first turn. This can only be accomplished if you have clear weather. 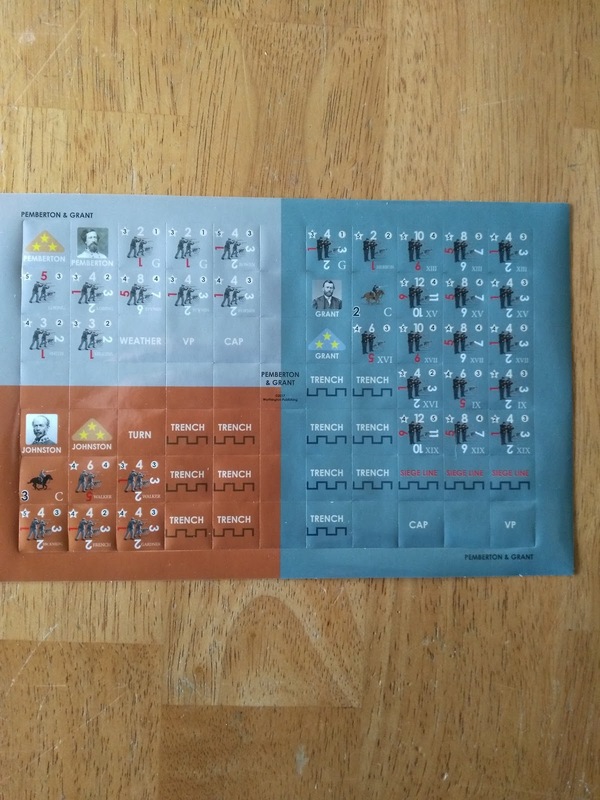 These Civil War series games, I know it's been used to death, are easy to learn and hard to master. The small amount of and easily understood rules make the game very easy to learn. The small amount of counters the player has to use also helps with the ease of play. However none of these can help the player make the right decision. That is all up to him and the vagaries that the game system throws at him. 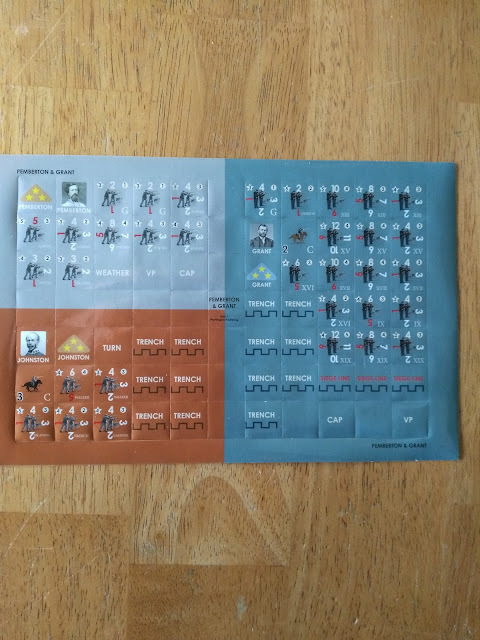 The map and block stickers are easy to read and very functional. The games are meant to cut to the heart of gaming and focus on the playing of the game, and not setup or rulebook browsing. Two questions have come up about the game. The first is where does the Pemberton counter start? 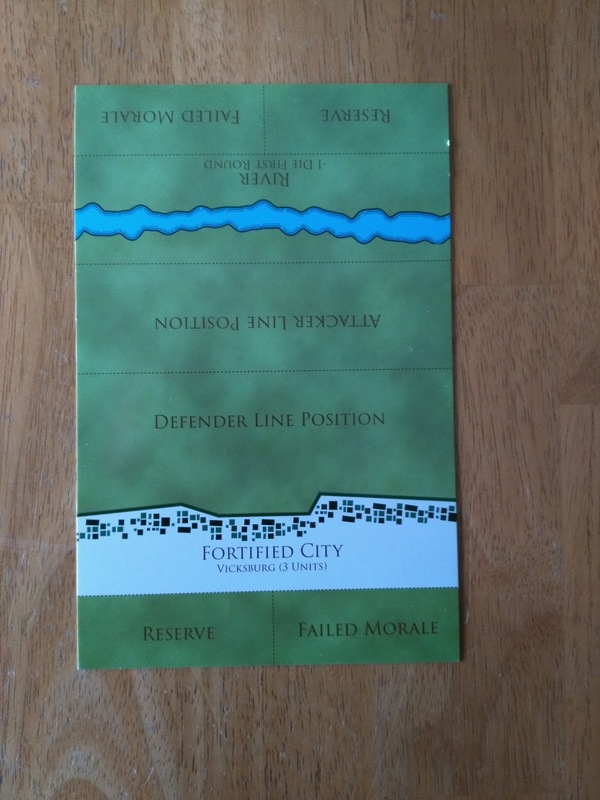 It is not shown on the setup portion of the games rulebook. He starts in Vicksburg. There are rivers and railroad lines on the map, and the game series talks about rules for movement on them. They are not used in this game. The next game I will be reviewing of Worthington Publishing will be 'Hold the Line: The American Revolution'. All of the Worthington Publishing games have high ratings on BGG.